Generally result from combined external rotation and dorsiflexion stress. Distal tibiofibular syndesmosisconsists of: AITFL, IOL, interosseous membrane, PITFL, and ITL. AITFL= anterior-inferior tibiofibular ligament: Originate = anterolateral (Chaput’s) tubercle of the tibia. Insertion: anterior (Wagstaffe’s) tubercle of the fibula. IOL= interosseous ligament: thickened distal part of the interosseous membrane. 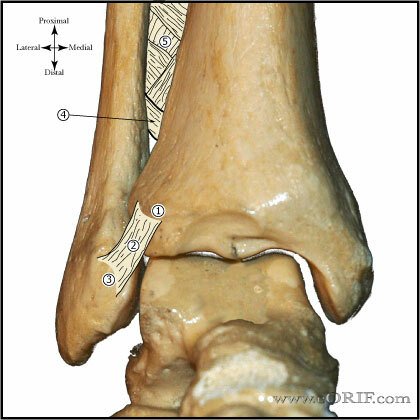 PITFL= posterior-inferior tibiofibular ligament. Origin: the posterior (Volkmann’s) tubercle of the tibia. Insertion: the posterior part of the lateral malleolus. Pain / tenderness over the anterior aspect of the syndesmosis, with minimal tenderness over the anterior talofibular or calcaneofibular ligaments. Squeeze test: compression of the fibula to the tibia above the midpoint of the calf causes separation of the two bones distally and pain at the area of the syndesmosis. External rotation test: external rotation of the foot while the leg is stabilized with the knee flexed at 90° causes pain over the syndesmosis. A/P, Lateral and Mortise views of the ankle and AP, lateral views of the entire length of the tibia and fibula. 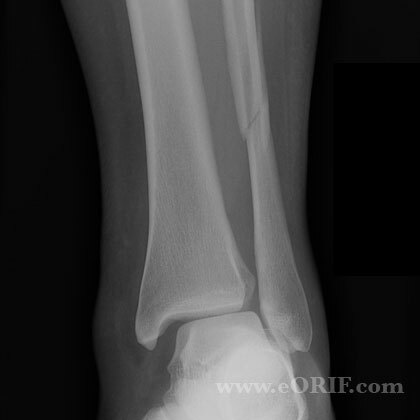 Evaluate for: ankle fracture, proximal fibula fracture (Figure 2), and the radiographic parameters below. (Harper MC, Foot Ankle 1989; 10: 156). Consider stress external rotation views. Tibiofibular clear space: (most reliable) the distance between the medial border of the fibula and the lateral border of the posterior tibia as it extends into the incisura fibularis, measured 1 cm proximal to the plafond. Normal = <6 mm in both AP and mortise views. 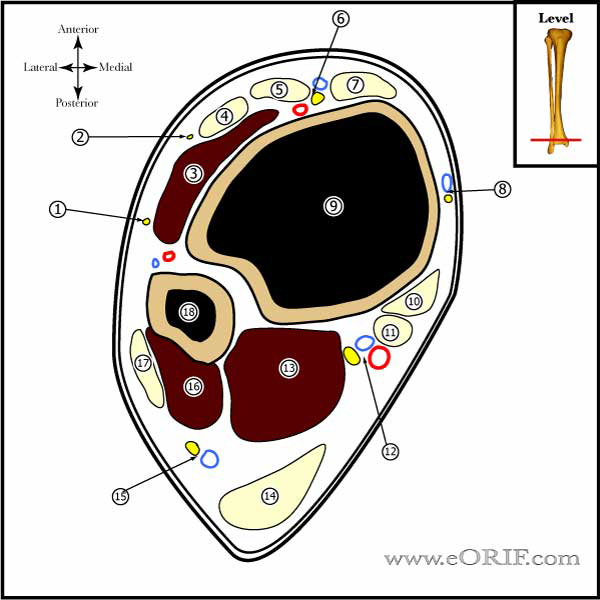 Tibiofibular overlap: overlap of the lateral malleolus and the anterior tibial tubercle measured 1 cm proximal to the plafond. 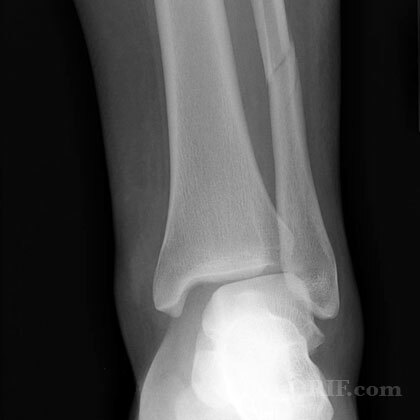 Normal AP view= >6 mm or >42% of the width of the fibula. Normal mortise view = >1 mm. Values progressively decrease with internal rotation. Medial clear space: distance between the lateral border of the medial malleolus and the medial border of the talus, measured at the level of the talar dome. In the mortise view with the ankle in neutral position, the medial clear space should be equal to or less than the superior clear space between the talar dome and the tibial plafond. Values progressively decrease with internal rotation. Increased medial clear space indicates deltoid ligament injury. MRI: highly sensitive and specific for syndesmotic injury. (Oae K, Radiology 2003; 227: 155). Syndesmotic injury without diastasis or instability. RX: rest, ice, compression, and elevation. Consider NWB cast for 2 to 3 weeks with progressive weight bearing in a cam walker after. Recovery time for syndesmotic sprain is considerably longer than severe nonsyndesmotic ankle sprain (55 versus 28 days). Often have asymptomatic interosseous calcification in the long term. (Hopkinson WJ, Foot Ankle 1990; 10: 325). Syndesmotic injury with diastasis or instability. RX: Syndesmosis reduction and fixation. 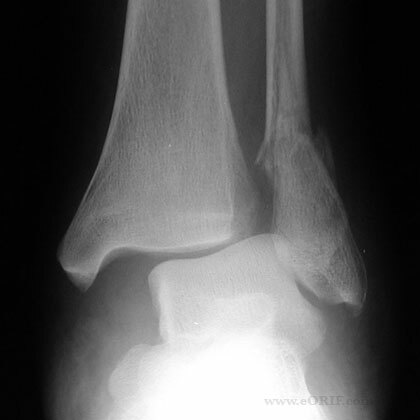 Syndesmosis injury with associated fracture. RX: associated fractures should be fixed with ORIF followed by fluoroscopic external rotation stress testing and evaluation of the medial clear space on mortise views. Any detected instability in the syndesmosis should undergo Syndesmosis reduction and fixation. Chronic Syndesmotic injury: arthroscopic resection of hypertrophic soft tissue with or without syndesmotic screw fixation (Han SH, Foot Ankle INt 2007;28:336). 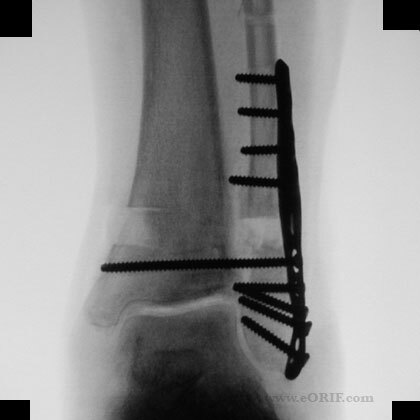 Consider arthrodesis )Olson KM,Salvage of chronic instability of the syndesmosis with distal tibio- fibular arthrodesis: Functional and radiographic results. J Bone Joint Surg Am 2011;93(1):66-72). 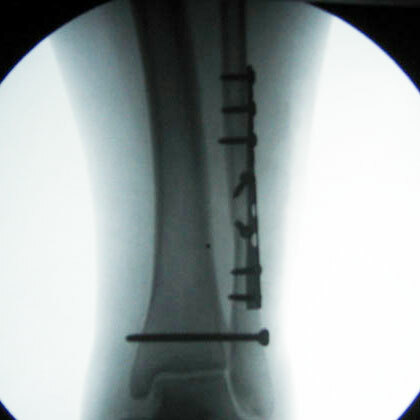 3 Months: schedule for syndesmotic screw removal.